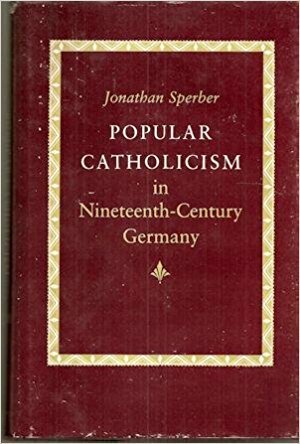 In Jonathon Sperber's book Popular Catholicism in Nineteenth-century Germany, he examines the forces that shaped popular Catholicism in the German land of North Rhine-Westphalia between the years 1830 and 1880, and the role the Catholic Church played in this time of profound change. Sperber argues that the Prussian state was unsuccessful in subsuming popular Catholicism because of the dynamic and flexible nature of the Catholic Church in Germany, and because of its ability to incorporate popular movements and sentiments into a fundamentally counterrevolutionary agenda. Sperber also agues that the church-state struggle Kulturkampf was not the origin of Catholic conservatism in Germany, but instead merely an exacerbating factor. Sperber supports his thesis by exposing the ways the Catholic Church encouraged new religious associations and Marian devotion, restructured pilgrimages, and accommodated the Prussian state while rejecting the ideologies of socialism and liberalism. Sperber approaches his project as a social historian primarily concerned with economic policies and social trends instigated by politicians and church officials and reflected by archival records kept by the church and state, such as census records, religious association membership and election results. While not delving into the popular experience directly, Sperber provides insight into the relationship between popular movements and political and religious rhetoric. While the reader may be left wondering how German Catholics of this era perceived their social identity or personal agency, Sperber compensates for his top-down treatment of his subject with his deftly nuanced analysis of the Catholic Church’s interaction with both internal and external forces. Against the backdrop of the secularization and economic change of the Vormarz period of the early nineteenth century, Sperber describes a Church losing control of its congregants. With the replacement of a guild-based economy with a capitalist system came new opportunities for sinfulness. Restrictions on marriage were loosened, and the clergy feared the sexual promiscuity that could potentially result. Formerly collective forest land was privatized, and this transformed previously innocent acts like hunting and wood-cutting into crimes. Sperber provides tables showing the demographic changes that imply the social upheaval experienced by German people increasingly uprooted, and suffering from the “disruption and disunity, decay of traditional practices”The Catholic Church was itself experiencing the winds of change with a growing division between the traditional ultramontane clergy and the clerical “hermesians,” influenced by enlightenment ideology. Having established the conservative nature of the German Catholic Church well before the Kulturkampf, Sperber investigates the struggle between the Prussian state and the Catholic Church. The May Laws, the expulsion of the Jesuits and the prosecution of priests performing illegal Mass were indeed, in Sperber’s opinion, exacerbating factors that led to the hardening of the Catholic Church’s conservative ideology, yet it was the rejection of liberalism, not the expansion of the Prussian state that served as the primary motivation. To further illustrate his point, Sperber uses the rhetoric of politically active Catholic Chaplains, such as Chaplain Laaf, who told an appreciative audience that, “The enemy of religion is liberalism, whose faith is disbelief and whose mother is the revolution”and Chaplain Schunks who proclaimed “he who shakes the alter topples the throne.” Sperber also emphasized the contentious relationship between the clergy and members of liberal, hermesian Freemason Lodges, viewed by many church officials as epitomizing “satanic subversion” and threatening the traditional order with conspiracy and revolution. Although dry intone and replete with impersonal tables and social analysis, Popular Catholicism in Nineteenth-Century Germany successfully conveys the conservative nature of the Catholic Church, and the integral role that Marian devotion played in the popular acceptance of that conservatism. While affected by Prussian state-building, Sperber shows that the politicization of German Catholicism originated in a visceral reaction against liberal ideals, decades before the punitive measures of the Kulturkampf. This page was last edited on 8 March 2019, at 17:09.